PEE Poll: Favourite PEEL Top 10 Animated Movie? Doing my research, as the original intention of the Futurama movies were actually Direct-To-Video movies that were later split into four TV episodes, I'll allow them in lists. I dunno, each movie's credits lists the production codes of 4 episodes, and the collective of the four movies is regarded both by fans and the show's staff as the fifth season. They may have been released as dvd movies before being broadcast that way, but as far as things go behind the scenes, they definitely weren't produced like movies. That was my main concern with having them being listed. I am aware PEEL is a Futurama forum, and I don't know how much weight they will bring to the overall rankings. If it were me personally, I wouldn't allow them. Technically they are animated movies, but as you say, Season 5 is 16 TV episodes split into four movies. Tough call, again rather indecisive of me, but Beamer has made my stance on not including them in the final lists for sure now. Don't get mad at me guys. I should have set the rules in the first post clearly, but I am going to say not to include Futurama movies in your lists. I think the results will be much better. Personally, I'd go purely on the distinction of whether straight-to-video releases are allowed or not. The Futurama movies aren't repackaged episodes in the same way that Imaginationland was. They were originally released as movies, so if anything, the episodes were the repackaging. They were produced to work as both in tandem, but I always got the sense that the crew were more focused on making them work as films that making them work as episodes - that being said, they still had to fit the ad-break and timing structure of four individual episodes, so it had a large impact on how they turned out. I don't think bias should be a problem here. If anything, we should embrace bias as this is PEEL's list. I mean, similarly, we're likely to be biased towards The Simpsons Movie and you could argue that we're going to be biased in favour of films based on animated sitcoms in general given that we're all established fans of those kinds of shows. Anyway, none of the Futurama films make my top 10 anyway, so it doesn't affect me. Personally, I'd go purely on the distinction of whether or not straight-to-video releases are allowed or not. You're right. Let's make this more straightforward and only allow theatrical movies on the lists. No Direct-To-Video movies from now on. None of the lists I received have any, anyways. Until somebody convinces you otherwise, right? But really, that call seems fair. Well, it's a good thing I didn't re-re-edit my list, or else I would have to re-re-re-edit my list. Just kidding! I received Scrappylive's list just now so I have 6 lists and 35 movies nominated so far. Keep it up, guys! Ralph Roeper bequeathed upon this post eleventy thumbs up! 8 lists and 45 movies so far. There's too many ties for the final list at the moment. Once, this has been complete, I think it might be interesting to do the same thing, only with movies in general. The deadline has been taken off for now. I chose Animated movies because of Futurama. I have sent a PM of your original list. You may change it. No new lists in almost two weeks now. We are currently on 45 animated movies. I've chosen my 10 movies, just having a really hard time deciding how to order them. You can order movies via a number of services these days - Netflix, Amazon, or even just your local Redbox. All updated now! Thanks to your new list, we finally hit 50 Animated movies! 10 lists and 50 movies. If you can't think of up to 10 movies for your list, I'll still accept it. I'm curious to see what movies other people picked. Is it against the point for each of us to post our own lists in here before your aggregated results? (I ask because nobody has done so yet.) Or maybe you can post a completely unordered list of the 50 different movies that have been sent to you so far, making it easier for more people to remember movies for their own lists to send you? Maybe you can post a completely unordered list of the 50 different movies that have been sent to you so far, making it easier for more people to remember movies for their own lists to send you? I think I've got a pretty good final list here, so I'm happy to conclude this final top 50 starting today. You can now discuss your lists in public. Oh, please don't send any more lists to me. I'll reveal the first 40 entries. Can you guess the correct order for the final 10? Here's the final 10. Sorry for triple posting. 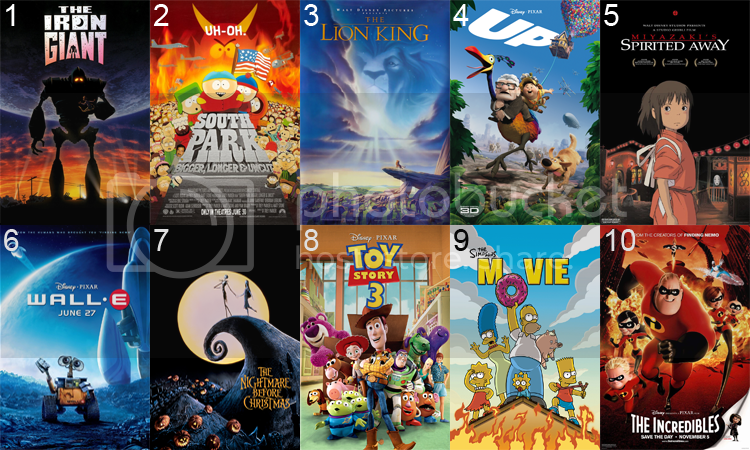 How many of your favourite Animated movies got in the top 10? What do you think? Quite a few of mine got in the top 10, so I'm pretty happy! I'm rather surprised to see how high Bigger, Longer and Uncut ranked on the overall list, but it's a pleasant surprise. I'd still consider Toy Story 3 to be Pixar's best work, but Up and Wall-E would be very close behind it for me. I also wanted to say that this was a great idea for a thread, AdrenalinDragon. The work you've put into this is truly admirable. I was also surprised by how high WALL-E made it. It's a fun and enjoyable film, but it didn't connect that strongly with me on an emotional level. I feel WALL-E's second half is weaker than the first. I'm actually surprised Ratatouille didn't get a single nomination, though. Usually The Lion King or Spirited Away wins these Top Animated Movie lists, so seeing an underdog like The Iron Giant come out on top was a nice surprise. I think we had a pretty good final ranking out of 11 lists. Maybe some more in the future. EDIT - Beamer had the most top 10 movies in the final top 10. I'm actually surprised Ratatouille didn't get a single nomination, though. It almost made it in mine, but the last few on my list are all very closely-ranked for me. I'd probably put it at #11. Ratatouille is my 17th favourite animated film (16th if you exclude straight-to-video movies), so it would have made the list if we did a top 20. My top 10 is really similar to that of the group, so I'm happy with the outcome.